This striking Grandstand with its clean and sharp lines and excellent lines of sight was constructed by the Company for a repeat business Client. After Canberra Stadium, it is the major centre for football in the ACT and hosts many interstate and local games as well as national championships. It contains approximately 600 seats, concession area, change rooms, storage, moderate corporate areas and press facilities. It has been designed to expand laterally as the need arises. The Company was not involved in the design of this project but was required to complete the works to a tight programme during a period of intense inclement weather. 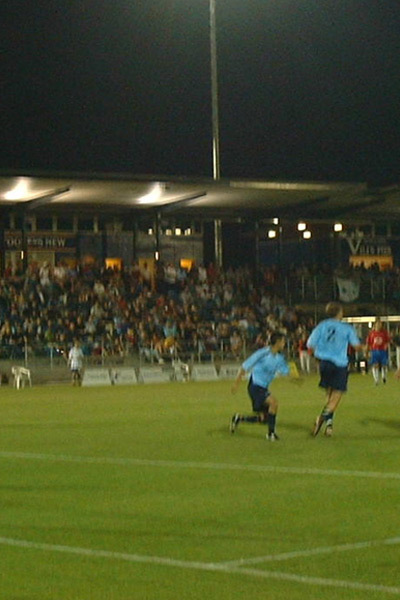 It constructed the works in a very orderly fashion and on time for the opening game of the 2002-03 NSW Super League game between Belconnen and Bonnyrigg White Eagles.